This second and final course in the Visio 2010 series, really helps tie the previous course up and elevate Visio skills to an expert level. Topics like creating technical layouts, custom themes, custom shapes, import and export XML data and much more are covered. This engaging and practical training course is available now throughout Hong Kong, including Central. This Visio 2010 Advanced training course can be delivered at your premises by one of our expert local or international trainers or live online using our HIVE technology. 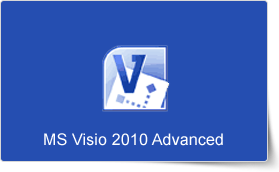 This Visio 2010 Advanced training course running in Central and Hong Kong wide, builds on the concepts and skills taught in Visio 2010: Introduction. Participants will learn how to work with layers, create custom shapes, themes, stencils and templates, and create business and project management diagrams.